Hair loss occurs in more than 60% of men and in approximately 10% of women. Although a lack of scalp hair can potentially increase the risk of actinic damage and skin cancer, male and female pattern baldness are conditions that are, with few exceptions, treated electively. Balding is a major concern for many, and surgery to treat hair loss (ie, hair transplantation) is the most common cosmetic surgery procedure performed on men today. Yet, the market for hair transplantation is dwarfed by the immense market for products that treat hair loss without surgery. These products, which include shampoos, hair-care cosmetics, scalp massagers, laser combs, and many more, have no proven efficacy except for their ability to temporarily increase the volume of existing hair, resulting in a denser appearance than before. Exceptions are the two medications the US Food and Drug Administration (FDA) approved: minoxidil (Rogaine, available over the counter in the United States) and finasteride (Propecia, available by prescription only for men), which have limited but definite benefit. 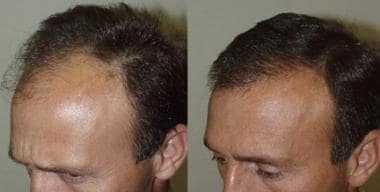 Interest in hair transplantation will probably increase as knowledge that most modern hair-transplantation techniques can create virtually undetectable restoration spreads, as shown below. To this day, hair transplantation remains the treatment of choice for most patients with hair loss. Case 1. Views before and 6 months after a procedure performed by using 2000 follicular-unit micrografts. One of the most rapidly growing segments of hair transplantation is hair transplantation in women. Surgical hair restoration was developed for and has traditionally been used in males. Newer techniques are more adaptable to females. Case 2. Views before and after 3500 follicular-unit micrografts performed in 2 procedures. Some say, "A bad hair day is better than a no hair day." For millions of individuals, hair loss is a major problem associated with loss of self-esteem, insecurity, and even depression. Hair loss can range from early thinning or hairline recession to complete loss of hair along the top and upper sides of the head. A full head of hair contains approximately 100,000 hairs. (People with red or blonde hair have somewhat more than this.) The loss of up to 30% of the number that was present during the peak of adolescence that occurs by middle age is part of the normal aging process. For thinning to become cosmetically noticeable, at least 50% of the hairs must have fallen out in a particular area. Loss of a smaller percentage than this generally does not result in the cosmetic appearance of hair loss. In addition to the loss of the number of hairs, the hair loss process causes individual hairs to thin, which further contributes to the appearance of hair loss. The Norwood Classification System recognizes and categorizes the typical sequence of the hair loss process in men. Early in the process (types 1-3), the hairline recedes, typically led by frontotemporal recessions. In the latter stages (types 4-7), progression of hair loss at the vertex (crown) gradually meets and joins the progressive hairline recession, resulting in varying sizes (in both coronal and sagittal dimensions) of the confluent vertex with frontotemporal regions of baldness. For women, the development of androgenic alopecia is classified into three stages. The typical pattern of hair loss in women is progressive diffuse thinning in an oval area along the top of the scalp. Hair loss along the hairline is usually spared. During the 1990s, leaders in hair transplantation debated several topics. Out of the debates emerged several commonly (though not unanimously) accepted truths. First is the superiority of hair grafting versus bald-scalp reduction and scalp-flap surgery in almost all situations. Second is the inferiority of lasers to conventional cutting devices to form the recipient site. Third is the acceptance of large-session micrografting, also termed the megasession, in which 2000 or more grafts can be transplanted safely in a single procedure. Nearly all hair-transplant specialists agree on the superiority of follicular-unit micrografting over traditional micrografting and minigrafting. Although follicular-unit micrografting is technically more demanding and time-consuming than other procedures, it yields superior results in terms of creating a natural appearance because hairs are transplanted as they grow naturally in the scalp. The procedure also enables dense graft placement when desired because individual grafts are small and thereby permitted small recipient sites and closer spacing. In addition, follicular-unit grafting reduces accidental transection of hair follicles during the graft-dissection process because dissection is performed under microscope visualization; therefore, wastage of valuable donor hairs can be reduced. The future of hair restoration is exciting, primarily because of medical advances. Improved effectiveness of control of hair loss coupled with minimization of adverse effects result from the use of 5-alpha reductase inhibitors that are specific for the hair follicle or from the use of medications that work by alternate pathways. In addition, gene therapy may have future application in hair loss treatment. The genes that cause alopecia can be located and potentially replaced with genetic sequences not associated with hair loss. Hair cloning (technically cell multiplication) may offer the surgeon a virtually unlimited supply of donor hairs. By cloning multiple copies of just a few donor hairs, patients with even extensive hair loss can expect complete scalp coverage, all with minimal donor-site morbidity. Most likely, follicle stem cells will be multiplied then injected into areas of thinning to initiate the regrowth of hairs. Candidates for hair cloning include those with advanced hair loss and those with scarring or poor supplies of potential donor hairs because of burn injury or previous poorly performed hair transplantations. Mechanization of the hair-transplantation process is perhaps the only way to improve the process of follicular-unit transplantation. Instruments capable of rapidly and accurately dissecting the grafts and atraumatically placing the grafts will speed the process and reduce reliance upon assistants. However, hair transplantation will remain an aesthetic procedure that requires a skilled surgeon to create natural-appearing results. According to the International Society of Hair Restoration Surgery, hair loss affects 21 million women in the United States, with varying impact on their psychological, social, and emotional well-being. Hair loss in men can be socially acceptable, and, in fact, deemed attractive or alluring. Conversely, society generally has less acceptance of thinning of hair or baldness in women. Women with hair loss often find it more difficult to share their feelings about hair loss with loved ones or friends or even their physicians. The scalp is divided into five layers, which are easily remembered by the mnemonic SCALP, which represents, in order from outermost to innermost layer, the skin, connective subcutaneous tissue, galea aponeurosis, loose connective tissue, and periosteum over the cranium. The skin contains all the epidermal appendages, including hair follicles, which extend into the connective subcutaneous layer. In areas that have undergone hair loss, thinning of the outer two layers usually occurs. This situation can be appreciated when one compares the thickness of the scalp in recipient areas with that in donor areas. The subcutaneous layer is well vascularized and contains the main penetrating branches of the named main arteries that travel primarily along the external surface of the galea. The importance of staying superficial along the connective subcutaneous tissue layer (when one makes slit recipient sites to avoid compromising circulation) has only recently become apparent. The scalp has an excellent blood supply. The supraorbital, supratrochlear, superficial temporal, postauricular, and occipital arteries are the primary vessels, and they typically travel with the veins. The galea aponeurotica is a nonelastic layer that connects the frontalis muscles anteriorly with the occipitalis muscle at its posterior aspect. The temporoparietal fascia, in which the superficial temporal artery travels, is also connected to the galea. The galea sliding over the loose connective-tissue layer allows for most scalp mobility. This loose connective-tissue layer and the periosteum below have minimal sensory innervation. The sensory innervation of the scalp closely follows the vascular supply. At the anterior aspect, the supraorbital and supratrochlear nerves provide sensation to the anterior half of the scalp. On occasion, sensation to the frontal scalp can diminish for several weeks when a large number of graft recipient sites are made along the hairline. The occipital nerve serves the posterior half of the scalp, whereas the supraauricular and superficial temporal nerves contribute innervation from the sides. Perhaps no anatomic feature of the scalp is more important with regard to hair transplantation than the microscopic distribution of hair. Scalp hairs usually do not grow individually; they most often grow in tiny follicular-unit bundles, which usually contain 2-3 hairs and occasionally 1 or 4 hairs. A follicular unit contains these 1-4 terminal hairs, a sebaceous gland element, and insertions of the arrector pili muscles, all wrapped in an adventitial tissue sheath. These follicular units are dispersed throughout the scalp, where non–hair-bearing skin constitutes up to 50% of the total tissue. By transplanting only these follicular units and dissecting away the 50% of unnecessary non–hair-bearing tissue, the most natural-appearing results can be attained. See Scalp Anatomy and Hair Anatomy for more information. In men, pattern baldness has been established as an androgen-mediated miniaturization process of genetically susceptible hair follicles. Women with pattern baldness are presumed to undergo the same process. Pattern baldness requires linking of the hormone dihydrotestosterone (DHT) to susceptible hair follicles. In the body, DHT is created when the enzyme 5-alpha reductase converts testosterone. This conversion takes place in the bloodstream and locally in the scalp and other body tissues. DHT acts on genetically susceptible hair follicles to cause miniaturization of the hair, which eventually leads to follicle death. Donor versus recipient dominance refers to the ability of hair grafts taken from an occipital donor area to grow and survive after transplantation to the frontal recipient site of alopecia. This phenomenon is explained by the presence of 5-alpha reductase in the cells of the recipient hair follicles. Again, this enzyme, found in skin, is responsible for conversion of testosterone to DHT. Even normal circulating amounts of testosterone may be excessively converted to DHT or the hair follicle may be abnormally receptive to DHT, creating androgenic alopecia. The donor follicles from occipital regions have less or no enzyme and thus are not influenced by hormonal factors. The mesenchyme-derived dermal papilla at the base of the mainly epithelial hair follicle controls the type of hair produced. This is probably the site through which androgens act on follicle cells by altering the regulatory paracrine factors produced by dermal papilla cells. Recipient dominant conditions refer to a diseased recipient area, which destroys the healthy donor follicle when transplanted. These conditions include cicatricial or scarring alopecia, such as discoid lupus erythematosus, lichen planopilaris (lichen planus of skin and hair follicles), and other active scarring skin diseases of hair and scalp that attack the healing donor follicles. These diseases can be treated medically and when the condition resolves, healthy hair grafts can be placed into the resultant but quiescent scar. Hair loss in men almost always is due to androgenic pattern baldness, which is usually referred to as male pattern baldness. Although the exact cause of pattern balding is unclear, the trait is transmitted by means of a polygenic type of inheritance. Anecdotal reports indicate a stronger link to men on the maternal side of the family than on the paternal side. Male pattern baldness is a progressive process that continues for the rest of an individual's lifetime. The eventual degree of hair loss is typically more advanced with a younger age of onset. In women, most hair loss is also genetic, although women have an increased incidence of hair loss caused by medical conditions, such as hormonal imbalance, trichotillomania, and poststress telogen effluvium. Interestingly, even with androgenetic alopecia in women, there appears to be an additional inflammatory contribution to hair loss, as scalp biopsies often reveal a localization of lymphocytic folliculitis around the stem-cell–containing bulge region of the hair follicle. As with male pattern baldness, female pattern androgenic hair loss is progressive. Alopecia areata is an autoimmune hair cycle shift that can be present in any area of the scalp, including donor areas, so that all scalp hairs may be involved, leaving no healthy donor follicles. It also resolves with medication and topical therapy, with hair regrowth in most instances. Diffuse female alopecia also involves the entire scalp and thus is not amenable to hair transplantation. The most common cause of hair loss in women is androgenetic alopecia. Unlike androgenetic alopecia in men, women tend to have diffuse thinning, often sparing the frontal and occipital regions. Differentiating androgenetic alopecia in women from other causes of alopecia is important. A positive family history usually accompanies androgenetic alopecia. Increased sensitivity to androgen with normal serum hormone levels is present. The pattern usually preserves the frontal hairline. Miniaturized hairs with varying lengths and diameters are present. Androgenetic alopecia must be differentiated from androgen excess disorders, which are often the result of adrenal, ovarian, or pituitary tumors or disorders. Be suspicious of androgen excess if the following are present: hirsutism, menstrual disorders, cystic acne, galactorrhea, virilization with temporal recession, lowering of voice, increase in muscle mass (especially the shoulder girdle), and infertility. The workup is best performed by an endocrinologist or gynecological endocrinologist. Rapidly thinning hair may suggest telogenic effluvium or endocrinopathies. Telogenic effluvium is best treated with minoxidil. Telogenic effluvium may be an acute generalized hair loss over the scalp, such as that occurring with stress, anesthesia, or childbirth. Hair regrowth usually occurs 4-12 months later. Chronic telogenic effluvium occurs more slowly and may be confused with androgenetic alopecia. Unlike the latter, chronic telogenic effluvium is not usually revealed in family history. Hair loss in women can be caused by numerous sources, such as hypothyroidism, various medications, systemic disorders, trauma (eg, surgical trauma, burn alopecia), and infections. Telogenic effluvium and androgenetic alopecia can coexist, with an episode of telogenic effluvium unmasking coexistent androgenetic alopecia. Scarring alopecia of unknown etiology is best evaluated by biopsy and dermatologic workup. The other large group of women presenting for hair transplantation are those with postsurgical scarring. Usually these patients have undergone browlifts and facelifts. Interest in eyebrow and eyelash transplantation has recently increased. The use of micrografting techniques with microscopes used for graft cutting has greatly improved these techniques. More recently, the use of follicular unit extraction (FUE), which is graft harvest with tiny micropunches, can decrease donor scarring. [10, 11, 12, 13] Eyebrow alopecia may result from plucking, trauma, or inherited thinning. Eyelash alopecia may also be traumatic, inherited, or caused by compulsive pulling or plucking. The incidence of hair loss in men approaches 60% by the age of 60 years. In women, this incidence is considerably lower, that is, approximately 10% at a similar age. Alopecia is a common problem within our population. In the United States, it is estimated that 35,000,000 men and 21,000,000 women experience hair loss. It is so common in men that it is actually accepted as normal. Androgenic alopecia in females is an increasingly frequent problem based on heredity and hormonal change. There is much speculation concerning the more frequent occurrence of this problem among premenopausal women, but the answer remains obscure. Both of these conditions are considered "donor dominant" and thus amenable to hair transplant surgery. Among racial groups, whites have the highest incidence of hair loss, African Americans have lowest incidence, and Asians have an incidence between the two. Patients must be given realistic expectations. Furthermore, the importance of joint planning by the patient and the surgeon for future hair loss cannot be underestimated. The transplanted hair follicles typically appear to grow in the immediate postoperative period. Within a month, the graft follicles enter the telogen phase and are all shed. Hair regrowth then takes approximately 4 months, but the hair continues to improve in quality and quantity over the subsequent 2-4 months. Growth stabilizes at about 1 year and reports have indicated graft survival rates of over 95% in experienced hands. Even 18 months after surgery, newly transplanted hairs have been observed to appear for the first time. The present techniques and technology of hair transplantation surgery can give a proper candidate realistic and natural appearing transplanted hair. Using 2 or 3 hair transplant sessions, the candidate has a successful outcome. Case 2. Close-up view of the hairline of a patient after transplantation of 3500 follicular-unit micrografts performed in 2 procedures. As with any surgical procedure, thorough counseling before hair-restoration surgery is critical. Patients require education to make informed decisions regarding this elective procedure, ie, whether to undergo it, and, if so, which procedures. Because hair restoration is cosmetic surgery, discussing patients' areas of concern, explaining treatment options, and providing a realistic picture of expected results are important. Patients should be provided with written information regarding both preoperative and postoperative instructions. After reviewing the patient’s list of medications to rule out any that may adversely interact with anesthesia administered during the procedure, it is important that various medications that may affect bleeding time be discontinued. Patients should stop taking all aspirin-containing medications, vitamin E, and ginkgo 10 days before the procedure and all nonsteroidal anti-inflammatory drugs (eg, ibuprofen) and alcohol 3 days before. To further reduce the risk of bruising and edema, patients are instructed to take vitamin C 2000 mg daily for 1 week before surgery. If the patient is to receive intravenous or twilight sedation, they should receive nothing by mouth (NPO) 8 hours before the procedure. Appropriately aligning patient and physician expectations is critical during the initial evaluation and consultation. Understanding the limits of a patient’s donor hair reserves, their hair characteristics, and their goals and motivation for undergoing hair transplantation can best help evaluate and articulate a projected outcome. Establishing this mutual understanding is one of the most effective ways to increase overall patient satisfaction. Wesley CK, Unger RH, Unger WP. Hair Transplantation. Thorne et al, eds. Grabb and Smith’s Plastic Surgery. 7th ed. Philadelphia, Pa: Lippincott Williams & Wilkins; 2013. 549-64. Bunagan MJ, Banka N, Shapiro J. Hair transplantation update: procedural techniques, innovations, and applications. Dermatol Clin. 2013 Jan. 31 (1):141-53. [Medline]. Williams KL Jr. Current practices and controversies in cosmetic hair restoration. Dermatol Surg. 2013 May. 39 (5):797-801. [Medline]. Rogers NE. Hair transplantation update. Semin Cutan Med Surg. 2015 Jun. 34 (2):89-94. [Medline]. Sadick NS. New-Generation Therapies for the Treatment of Hair Loss in Men. Dermatol Clin. 2018 Jan. 36 (1):63-67. [Medline]. Norwood OT. Male pattern baldness: classification and incidence. South Med J. 1975 Nov. 68 (11):1359-65. [Medline]. Liu YS, Jee SH, Chan JL. Hair transplantation for the treatment of lichen planopilaris and frontal fibrosing alopecia: A report of two cases. Australas J Dermatol. 2017 Jul 24. [Medline]. Magro CM, Rossi A, Poe J, Manhas-Bhutani S, Sadick N. The role of inflammation and immunity in the pathogenesis of androgenetic alopecia. J Drugs Dermatol. 2011 Dec. 10 (12):1404-11. [Medline]. Redmond GP. Androgenic disorders of women: diagnostic and therapeutic decision making. Am J Med. 1995 Jan 16. 98 (1A):120S-129S. [Medline]. Rassman WR, Bernstein RM, McClellan R, Jones R, Worton E, Uyttendaele H. Follicular unit extraction: minimally invasive surgery for hair transplantation. Dermatol Surg. 2002 Aug. 28 (8):720-8. [Medline]. Harris JA. Powered blunt dissection with the SAFE System for FUE. Hair Transplant Forum International. Nov/Dec 2011. 20:188-89. Gupta J, Kumar A, Chouhan K, Ariganesh C, Nandal V. The Science and Art of Eyebrow Transplantation by Follicular Unit Extraction. J Cutan Aesthet Surg. 2017 Apr-Jun. 10 (2):66-71. [Medline]. Figueira E, Wasserbauer S, Wu A, Huilgol SC, Marzola M, Selva D. Eyebrow reconstruction. Orbit. 2017 Oct. 36 (5):273-284. [Medline]. Salanitri S, Gonçalves AJ, Helene A Jr, Lopes FH. Surgical complications in hair transplantation: a series of 533 procedures. Aesthet Surg J. 2009 Jan-Feb. 29 (1):72-6. [Medline]. Garg S, Kumar A, Tuknayat A, Thami GP. Extensive Donor Site Keloids in Follicular Unit Extraction Hair Transplantation. Int J Trichology. 2017 Jul-Sep. 9 (3):127-129. [Medline]. Knudsen RG, Unger M. Unger W, et al. Hair Transplantation. 5th ed. New York, NY: Marcel Dekker; 2011. 419-22. Chiang YZ, Tosti A, Chaudhry IH, Lyne L, Farjo B, Farjo N, et al. Lichen planopilaris following hair transplantation and face-lift surgery. Br J Dermatol. 2012 Mar. 166 (3):666-370. [Medline]. Wesley CK. Enhanced Patient Selection: The Folliscope. Unger and Shapiro, eds. Hair Transplantation. 5th ed. New York, NY: Marcel Dekker; 2011. 82-3. Farris PK, Rogers N, McMichael A, Kogan S. A Novel Multi-Targeting Approach to Treating Hair Loss, Using Standardized Nutraceuticals. J Drugs Dermatol. 2017 Nov 1. 16 (11):s141-s148. [Medline]. Jimenez JJ, Wikramanayake TC, Bergfeld W, Hordinsky M, Hickman JG, Hamblin MR, et al. Efficacy and safety of a low-level laser device in the treatment of male and female pattern hair loss: a multicenter, randomized, sham device-controlled, double-blind study. Am J Clin Dermatol. 2014 Apr. 15 (2):115-27. [Medline]. Epstein JS. Hair transplantation in women: treating female pattern baldness and repairing distortion and scarring from prior cosmetic surgery. Arch Facial Plast Surg. 2003 Jan-Feb. 5 (1):121-6. [Medline]. Frechet P. Donor harvesting with invisible scars. Hair Transplant Forum Intl. 2005. 15(4):119-20. Nordström RE, Greco M, Vitagliano T. Correction of sideburn defects after facelift operations. Aesthetic Plast Surg. 2000 Nov-Dec. 24 (6):429-32. [Medline]. Barrera A. The use of micrografts and minigrafts in the aesthetic reconstruction of the face and scalp. Plast Reconstr Surg. 2003 Sep. 112 (3):883-90. [Medline]. Harris JA. Follicular unit transplantation: dissecting and planting techniques. Facial Plast Surg Clin North Am. 2004 May. 12 (2):225-32. [Medline]. Lee SJ, Lee HJ, Hwang SJ, Kim DW, Jun JB, Chung SL, et al. Evaluation of survival rate after follicular unit transplantation using the KNU implanter. Dermatol Surg. 2001 Aug. 27 (8):716-20. [Medline]. Haber RS, Unger M, Unger W, et al. Hair Transplantation. 5th ed. New York, NY: Marcel Dekker; 2011. 279-80. Rashid RM, Morgan Bicknell LT. Follicular unit extraction hair transplant automation: options in overcoming challenges of the latest technology in hair restoration with the goal of avoiding the line scar. Dermatol Online J. 2012 Sep 15. 18 (9):12. [Medline]. Seager DJ. Micrograft size and subsequent survival. Dermatol Surg. 1997 Sep. 23 (9):757-61; discussion 762. [Medline]. Limmer R. Micrograft survival. Stough D, Haber R, eds. Hair Replacement. St. Louis, Mo: Mosby; 1996. 147-49. Kim JC. Unger W, Shapiro R, et al. Hair Transplantation. 5th ed. New York, NY: Marcel Dekker; 2011. 404-6. Unger WP. Delineating the "safe" donor area for hair transplanting. Am J Cosmetic Surg. 1994. 239-43. Wesley CK, Teo LH, Xu T, Unger RH, Unger WP. The influence of peri-incisional triamcinolone acetonide injection on wound edge apposition. J Dermatolog Treat. 2014 Aug. 25 (4):345-9. [Medline]. Case 1. 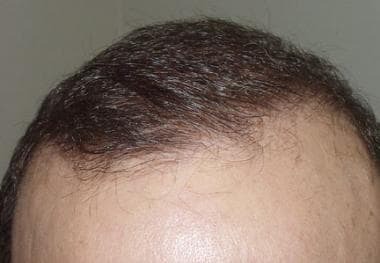 Close-up view of the hairline of a patient 6 months after a procedure performed by using 2000 follicular-unit micrografts. Disclosure: Received grant/research funds from Clinical Cell Culture for co-investigator; Received honoraria from Integra Life Sciences for speaking and teaching; Received honoraria from Healogics for board membership; Received honoraria from Anika Therapeutics for consulting; Received honoraria from Food Matters for consulting. Disclosure: Received honoraria from AO North America for speaking and teaching. Fast Five Quiz: How Much Do You Know About Melanomas? Fast Five Quiz: How Much Do You Know About Merkel Cell Carcinoma?